Jellyfish are known for their ability to take over ecosystems, even though they're less efficient swimmers and hunters than their fishy competition. But a new study shows that jellyfish may rule the waves by actually being the most energy-efficient animals in the world. Here's how. A Plague of Jellyfish Headed for the U.K. If you've ever watched a jellyfish swim, you know its movement relies on opening and closing its bell. The animals have a ring of muscles around the edges of their bell — when they tighten these muscles, the bell contracts. This contraction forces out water that was stored inside the bell. "They have radial symmetry, so when contract all the way around, they shed this doughnut-shaped body of fluid that is spinning around itself," said Brad Gemmell, a marine biologist with the Marine Biological Laboratory in Woods Hole, Massachusetts. "They shed these vortex rings behind them, and this shedding creates some thrust." After boosting forward in the contraction phase, jellyfish relax their muscles and open their bell, before snapping their bell shut again. To estimate the swimming efficiently of jellyfish (and other animals), researchers often calculate the Froude number, a dimensionless metric originally designed to quantify the propulsion performance of ships. Based on this number, jellyfish have a swimming efficiency of 0.09–0.53, compared with the 0.8 Froude efficiency of many fish. But there are a few issues with this metric, including that it doesn't account for the metabolic energy demand of swimming or the relaxation phase in jellyfish swimming. As part of a Navy-funded project, Gemmell and his colleagues have been investigating "non-traditional propulsion." One of their model organisms has been the jellyfish, and they've been trying to understand how jellyfish swim, how they create their vortex rings and how those rings interact with each other to create thrust. Over the course of their research, the team noticed that when they plotted the animals' velocity over time, a secondary spike in acceleration and velocity between contraction phases would show up. "We didn't pay much attention to it at first because we thought it was just noise," Gemmell told io9. "But it was there every time and it was very consistent." So the team decided to investigate it further using a technique called 2D digital particle image velocimetry, which involves seeding water in a tank with hallow glass spheres that are just 10 microns in size. "When you shine a bright laser in a thin sheet, it illuminates the particles," Gemmell explained. The researchers used a high-speed video camera and special software to record and analyze the movements of the particles as moon jellyfish (Aurelia aurita) swam through them. They discovered that jellyfish swim using a dual-propulsion system that involves two vortices. As the first vortex (the "starting vortex") pinches off, a second vortex forms, spinning in the opposite direction (the "stopping vortex"). When the animal relaxes its muscles and opens its bell, the stopping vortex moves up underneath the jellyfish, giving it a secondary push. This second thrust comes essentially free, Gemmell said, since it occurs during the relaxation phase. What's more, it accounts for 30 percent of the distance travelled by the jellyfish for each movement cycle. To calculate the jellyfish's swimming efficiency, the researchers used a method called "cost of transport," which, unlike the Froude number, takes into account the energy required to generate kinematic and fluid motion. 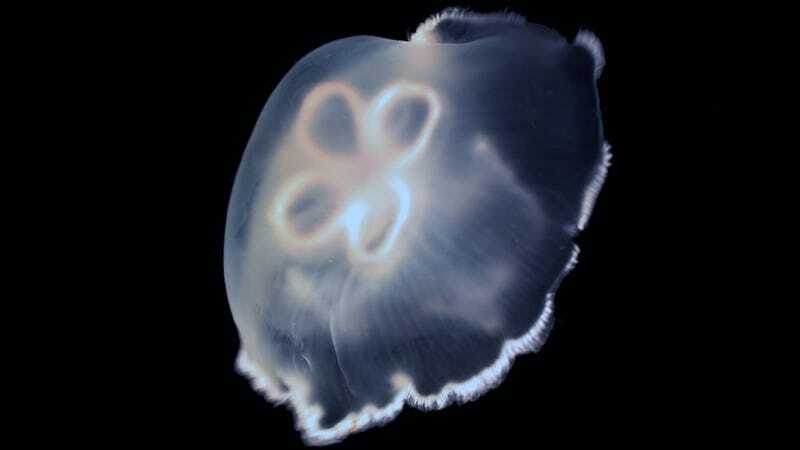 They determined that the moon jellyfish swims about 3.5 times more efficiently than salmon. And, interestingly, they estimated that the jellyfish's cost of transport would be about 50 percent greater if they didn't have the secondary thrust. This high swimming efficiency may very well explain how jellyfish can form the large blooms they're known for. "If fish and jellyfish both capture 10 grams of food, the fish will take a bigger proportion of the 10 grams and put it towards movement, compared with the jellyfish," Gemmell said. "But the jellyfish can use that energy to grow and reproduce at a faster rate." Gemmell also noted that the Navy has an interest in the applications of the team's findings. If instruments need to be deployed in the water column and maintain their position for months at a time, it would be helpful if they could take advantage of an efficient, jellyfish-like propulsion system. And, in fact, as part of the overarching Navy-funded project, Virginia Tech researchers are already developing jellyfish robots, Gemmell said. Media courtesy of Brad Gemmell.